A reinvigorated Accept continues to storm through the world pummeling everything in sight with their old school heavy metal tank of destruction. Bringing Mark Tornillo into the was a stroke of genius as he really sounds right at home backed by one of Germany’s best and heaviest metal masters. Although I didn’t find Stalingrad to hit me as immediately as the pummeling Blood of the Nations did, this album is essentially “Blood of the Nations, Part 2”, even if it is a bit more melodic. In the end though, I would rank this album to be every bit just as pleasurable as Blood of the Nations. 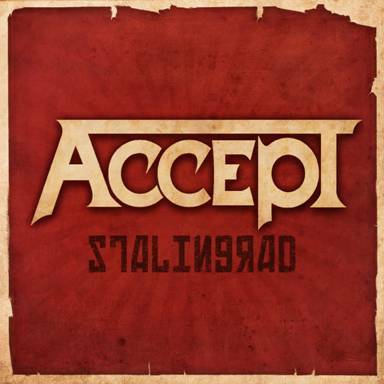 Make no mistake that Stalingrad is no-frills traditional pounding heavy metal and it’s legitimate (i.e. they actually helped to create the genre and aren’t just ripping it off 30 years later) that we should all be thankful for. Lap it up while you can, who knows how much longer the old masters can continue to crank ’em out like this? From out of nowhere (well, Germany) comes one of the year’s best albums! Man, my indifference towards Accept is well-documented but this is one KILLER heavy metal album! When I heard T.T. Quick frontman Mark Tornillo was filling in for Udo Dirkschneider (who respectfully declined to reunite with his old band mates), I was mildly curious. T.T. Quick’s Metal of Honor is one of my favorite albums and Tornillo has a great voice so that really put this album on my want list. Had it been some unknown singer, I may have never given this album a shot. Surprisingly, nearly 25 years later, Mark is singing with as much power and fury as ever. This album is a triumphant return for the band. Even without their lead singer, they managed to break into the Billboard 200 with this album (#187) when their three ’90s albums with Udo did not. In addition to the minor chart victory, rave reviews are coming in from all over the world. It’s amazing to think this band has been chugging along (on and off) since the late ’70s because they are as fast and as heavy as they have ever been. This is such a powerful old school heavy metal album and I would like to add my name to the list of people that say Andy Sneap should produce the next Metallica album! I’m not sure how true this is, but I’ve seen some sites list “Time Machine” as a bonus track for the digipak version of the album, which is the version I own. On the packaging, I don’t see any reference to it being a bonus track. Balls to the Wall is Accept’s best album, but this would be my second favorite. It’s a lot more accessible and pop-metallic than the pure heavy metal thunder of Restless and Wild and that’s probably why I like it so much. Restless and Wild was heavy, Balls to the Wall was heavy, melodic & commercial, and Metal Heart goes even more commercial and melodic. “Metal Heart” is the most aggressive song here and the obvious standout but who can resist the pop metal of “Midnight Mover” and “Screaming for a Love-Bite”? I’m not sure where I stand on “Teach Us to Survive”. It’s like some jazzed up version of theme that you might hear from a 1960s spy show. A fine “heavy metal platter”. What? It’s a cliched term and I wanted to use it. 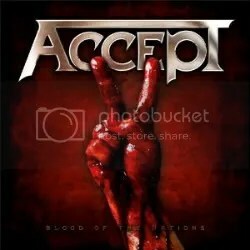 Accept is one of those bands that I never fell head over heels for like so many other metal fans have. I look at them as the German equivalent of Judas Priest, except they aren’t anywhere near as good as Priest, in my opinion. After owning Balls to the Wall for quite some time, I figured I’d give Accept a shot again. 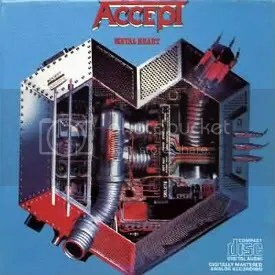 From what I’ve heard, this is considered one of Accept’s best (if not THE best) albums and it’s not hard to hear why that would be, but even so, I’m not blown away by the album. There’s a handful of really good numbers (with “Fast as a Shark” and “Princess of the Dawn” being the true standouts), but I wouldn’t call the album “great”. I prefer the more melodic Metal Heart and Balls to the Wall. My copy is the 2001 Legacy Recordings remaster featuring two live bonus tracks. This is an absolute classic. 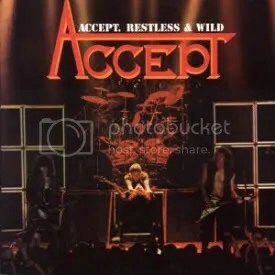 Accept was a band I had heard about for a long time, but wasn’t familiar with until probably 2002 or so when I scored this through the Columbia House Music program (say what you will about them, but the initial free CD offer they did was AMAZING).